Beat Manchester City on Saturday and Leicester will win the Premier League title, draw or lose at Etihad Stadium and they will have to settle for second place. That is the verdict of SAM (Sports Analytics Machine), the super-computer built by Ian McHale, professor of sports analytics at the University of Salford, together with his colleague Tarak Kharrat. We've asked SAM to predict the outcome of every Premier League game between now and the end of the season - and the results suggest the race will be so tight that the destination of the title hinges on this one game. If you're sceptical about the ability of a computer to predict football matches, it is worth noting that SAM took on BBC pundit Mark Lawrenson in Lawro's predictions earlier this season and remains top of the guest leaderboard, having been more accurate than any other participant during 2015-16. According to SAM, Leicester will lose only one more match this season - their game against Manchester United at Old Trafford on 30 April. So excluding Saturday's game, the two teams are predicted to be separated by less than half a point at the end of the season, with a series of draws allowing Manchester City to leapfrog Leicester. The bad news for Leicester fans? SAM has Saturday's game down as a draw, meaning Manchester City will go on to win a third Premier League title in five seasons. A draw on Saturday will keep Leicester in control at the top of the table for the time being, while three wins in their following five games will strengthen their position. But SAM expects Manchester City to be similarly consistent, and predicts they will finally overtake the Foxes on 23 April with a home win against Stoke, while Leicester's home draw with Swansea on the same weekend will prove costly. It is a lead Manuel Pellegrini's men will not relinquish. Despite a predicted winless final three games to the season for Manchester City (draws against Southampton, Swansea and Arsenal), Leicester will also fail to win any of their last three fixtures (loss to Manchester United before draws with Everton and Chelsea). If things do go as predicted it will make for a thrilling end to the season, with the title race going to the final day, but Manchester City will be champions and Leicester will have to make do with second and a place in the Champions League. SAM takes into account a wide range of factors to work out match results, looking at average performances so far and calculating what that means for the remaining fixtures. 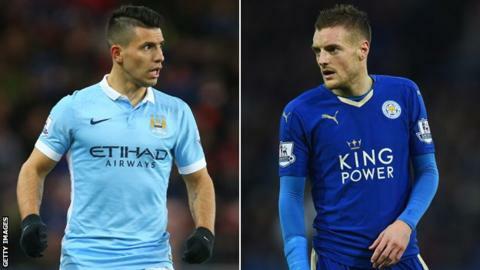 It is based on players remaining fit and continuing with their average performance levels, so an injury to Sergio Aguero or Jamie Vardy, for example, would have a significant impact on these predicted outcomes. "Dear Leicester, I want you to win the league because my team can't"
Read more on "Dear Leicester, I want you to win the league because my team can't"